Being efficient is every parent’s dream. Time is a limited resource and the faster we do things, the more time we have left to spend with our kids. So when I meet “the girls” for an evening out, we always talk about household stuff and share ideas. Making dinner is one particular task that takes lots of energy. I have heard many parents saying they come home at the end of a working day and start making dinner. 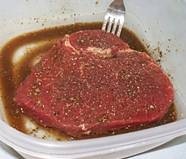 As you know, if you do not buy fresh meat just before you cook it, you may need to take it out of the freezer and wait for it to thaw or spend valuable time to defrost it in the microwave or in tons of running water. 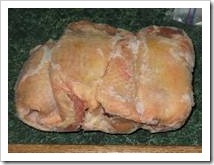 One tip I have found very useful was to take the frozen meat (or chicken) out of the freezer just before I go to bed. Usually, putting it in the refrigerator is enough to thaw it for the following day. The idea of thinking the night before worked very well for me, but it was still not perfect. One of “the girls” reminded me that although the meat is thawed by dinnertime, many recipes require the meat (or chicken) to be marinated for at least half an hour before cooking or frying and longer is better. 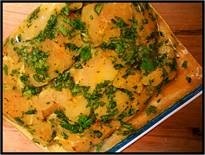 She remarked on it extending the length of making dinner by the marinating time. So I said, “Well, before you put it in the freezer, you can marinate it so that when you need to fry it, roast it or cook it, you do not need to wait for it to marinate for half an hour”. The next day, I decided to use my own tip and it worked like magic. I bought meat and chicken for 4 or 5 meals, marinated them, split them into meal portions, stored them in clean plastic bags, wrote on each bag what was in it with a permanent marker and the date and put everything in the freezer. When the time came, I took each bag out of the freezer, let it thaw and cooked it when it was time to make dinner without having to wait, because it was already very well marinated. Not only did that save me time but the taste was great! Yesterday, at 5pm, I woke up from my work (I was focused on finishing an article) and said, “Oh, I forgot dinner!” When I got into the kitchen, I found a plastic bag with thawed, marinated chicken in it. It took me 5 minutes to put it in a tray and shove it in the oven. An hour late, the kids set the table for dinner, I made some salad and it took us a total of 10-15 minutes to prepare dinner (while the chicken was in the oven, I went back to finish my article). We have been marinating our meat for over a year now and to my (initial) surprise, because the meat was marinated for a long time while freezing and thawing, it came out both delicious and tender. 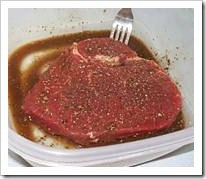 Marinate your meat before you freeze it. 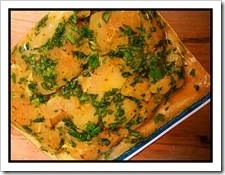 It takes less time to marinade 5 meals at once than each of them separately. You even save time washing the dishes you use. Good time management involves this kind of time saving trick. Marinating the meat as soon as we buy it is an easy and simple way to reduce meal preparation time, when everyone around is hungry and agitated, and have dinner ready in 15 minutes flat. If you have household tips that other parents can use, use the comment box below to share with other parents and subscribe via RSS or email to get the next tips in this series.